With Faxbot you can comfortable send faxes on your iOS device via your FRITZ!Box. Faxbot offers you extensive opportunities to integrate faxing into your best workflow. 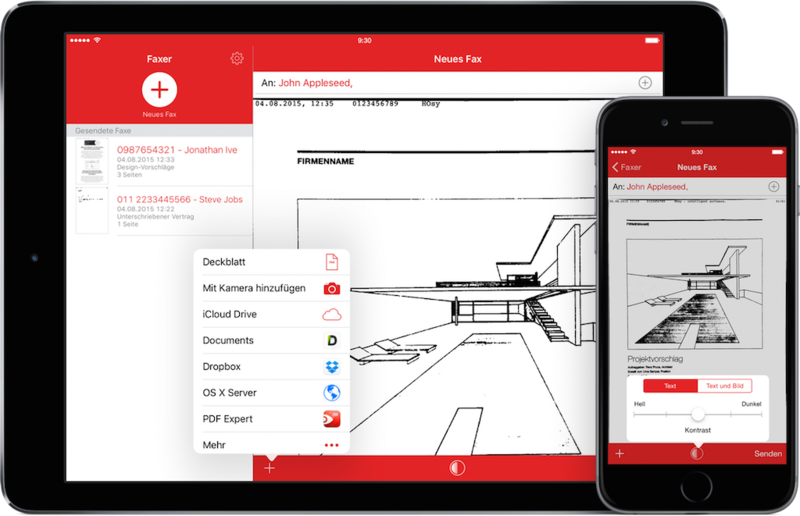 So you can open PDF files in Faxbot and send it, pass PDF documents from any apps to Faxbot, write faxes directly into Faxbot and scan documents with the iOS camera. With your iOS camera, you can capture real documents and send them directly as a fax. Faxbot has an integrated intelligent document recognition and generates a PDF file. You can pass a PDF file from another app via share menu directly to Faxbot. With the documents menu, you have the opportunity to access documents from iCloud Drive or other apps like Dropbox, ownCloud, Documents, etc.. You can attach any number of documents to a fax. Would you send a quick fax, without creating it in an other app or do you want to add a cover sheet to a selected document? Faxbot offers you the opportunity to create a fax or a cover sheet. After sending a fax a detailed transmission report is created. This is stored with the transmitted fax. Depending on the type of the document, you can select the best algorithm for the transmission. Choose between text and fast transmission or text and graphics with a fine resolution but at a slower transmission. Faxbot is optimized for both the iPhone and the iPad.